The 2015 college football season kicks off in a little more than 24 hours, marking the end of summer’s boundless sunny prognostications and the arrival of autumn’s cold, hard truths. Of 128 FBS teams, only eight will open the season ranked in the top 10 in both the Associated Press and Coaches polls and listed with odds of 25-1 or better to win the second edition of the playoff, according to Vegas Insider. In the end, there’s a very good chance one of those eight will be the last team standing in Glendale, Arizona, come January, exhausted and exultant. In each case, though, the odds are at least as likely that the championship push will fall short due to an Achilles’ heel that was readily apparent in August. When the stakes are this high, it takes only one bad day to ruin the best-laid championship plans. From the back of the pack to the front, here’s why each of the front-runners could ultimately fail. 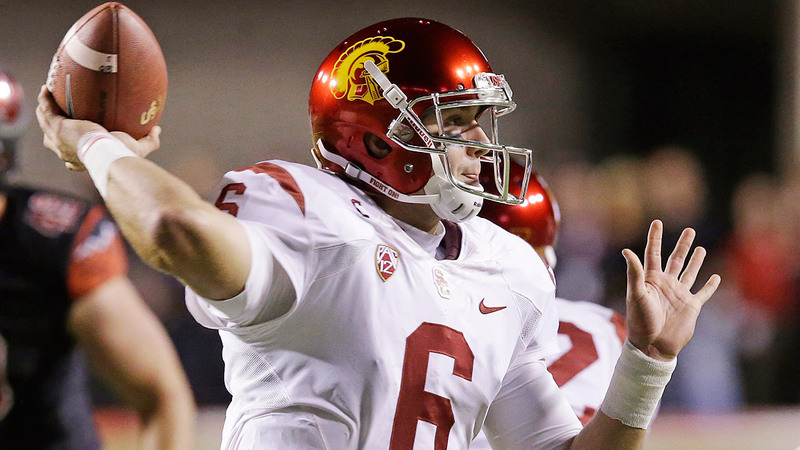 Rick Bowmer/AP Cody Kessler has Heisman potential but must improve his play against ranked opponents. The four ranked teams on the bottom row were Arizona State, Arizona, Utah, and UCLA, a group that accounted for three of USC’s four losses (the fourth came against Boston College, despite one of Kessler’s best statistical outings) and held the Trojans to 25.8 points per game, more than two touchdowns below their average against the rest of the schedule. And while it’s not entirely fair to suggest Kessler was a no-show in notable games — he was brilliant against the remnants of Notre Dame’s beleaguered defense in the regular-season finale, as well as in a 45-42 Holiday Bowl win over Nebraska — it’s hard to get too worked up over an ostentatious stat line once it becomes clear how much of it was racked up against the likes of Fresno State, Colorado, Washington State, and California.1 The defining moment of both Kessler’s season and his team’s was a 38-20 loss at UCLA, where Kessler was sacked six times and picked once with the Pac-12 South title on the line; the loss marked USC’s third straight in the series, all by double digits. Reversing that trend in 2015 begins with more consistency behind center. 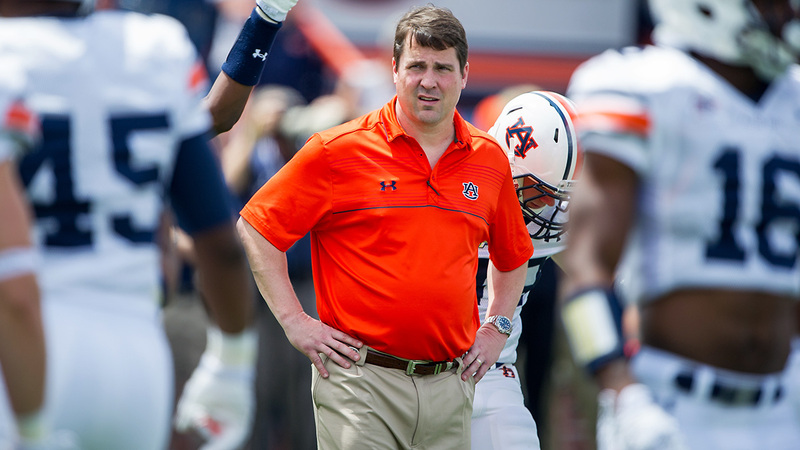 Michael Chang/Getty Images Auburn’s title hopes could hinge on Will Muschamp’s ability to rebuild a shaky defense. It’s a testament to the up-tempo Gus Malzahn machine that an offense tasked with replacing its starting quarterback, the SEC’s leading rusher, a third-round draft pick at wide receiver, and an All-American center is almost universally expected to keep pace. In fact, most of the hype preceding the new quarterback, Jeremy Johnson, and up-and-coming backfield mates Roc Thomas (the surprise Week 1 starter) and Jovon Robinson indicates that the 2015 edition will be even better than the one that averaged 35.8 points last year against FBS opponents. On the other side of the ball, though, the narrative is precisely the opposite: After yielding at least 31 points in their final seven FBS contests of 2014 and losing the last four of those, the defense remains a wholesale rebuilding job for new coordinator Will Muschamp. Reading some of the more optimistic projections this summer, one might think Muschamp’s presence alone, like Malzahn’s on offense, is enough. And Muschamp certainly has the track record, having overseen consistently killer units in his previous stints at LSU (under Nick Saban), Auburn (under Tommy Tuberville), Texas (under Mack Brown), and even in his failed stint as Florida’s head coach, where his defensive efforts were undermined by a succession of moribund offenses. And he certainly has the requisite talent on hand, boosted this year by blue-chip transfers Tray Matthews (from Georgia) and Blake Countess (Michigan) in the secondary and the return of former five-star prospect Carl Lawson from a torn ACL at defensive end; behind Lawson, there’s also freshman Byron Cowart, the most coveted pass-rusher in the 2015 recruiting class. If the offense is as good as advertised, it won’t take much improvement on defense to turn last year’s eight-win team into an 11- or 12-win outfit with an inside track on a playoff bid. But both sides of that equation remain, for now, strictly hypothetical. 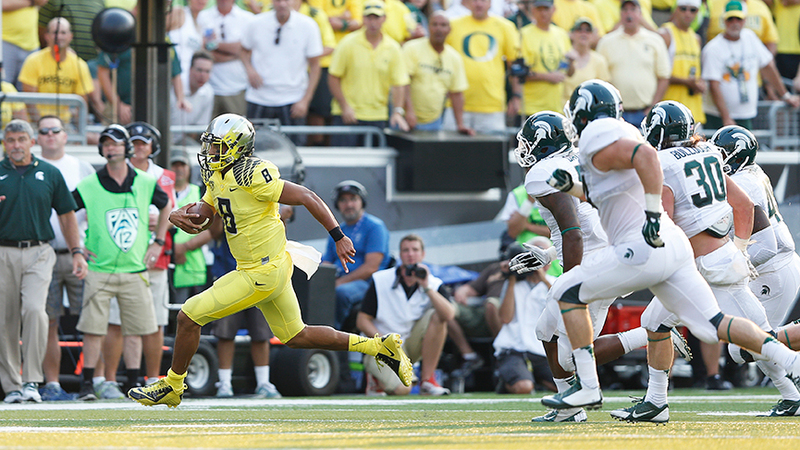 Joe Robbins/Getty Images Marcus Mariota shredded Michigan State’s typically stout defense last season. Now, it probably goes without saying that most defenses are going to fare significantly worse against Marcus Mariota, J.T. Barrett, and Petty than against everyone else. Still, MSU’s gap was particularly huge: Against unranked teams, the Spartans posted the best pass efficiency defense in the nation; against ranked teams, they came in 103rd. That was with Narduzzi on the headset and a pair of since departed first-team All–Big Ten picks, Trae Waynes and Kurtis Drummond, among the starting defensive backs. With Oregon and Ohio State looming again as the defining games on the Spartans’ schedule, a playoff run hinges on much better results from their successors. David J. Phillip/AP Chris Seisay and his fellow defensive backs will have big shoes to fill in Eugene this season. Under most circumstances, Mariota and his 36-5 record as a starter would be irreplaceable. But most offenses aren’t Oregon’s, which led the Pac-12 in scoring in each of the five seasons preceding Mariota’s first year in the lineup, and most replacements don’t come with a résumé like Eastern Washington transfer Vernon Adams’s. The two-time runner-up for the Walter Payton Award (given to the FCS’s top offensive player) arrived on campus last month and earned the QB1 gig last week, and expectations for the Ducks’ warp-speed offense have barely budged from where they’ve resided for most of the past decade. But the same can hardly be said for the secondary, which was mediocre at best in 2014 — Oregon ranked 56th nationally in pass efficiency defense and 36th in Defensive Passing S&P+, well behind the curve for an aspiring national champion — despite boasting three senior starters (Ifo Ekpre-Olomu, Troy Hill, and Erick Dargan) who were voted first- or second-team All-Pac-12. In their place, the Ducks will turn to a trio of underclassmen, Chris Seisay, Arrion Springs, and Tyree Robinson, who collectively amount to a blank slate; aside from Seisay’s starting turn in place of an injured Ekpre-Olomu in the playoffs and a spot start for Robinson against Utah, most of their contributions last year came on special teams. This year’s Pac-12 quarterback crop isn’t quite as unforgiving as last year’s, but add in Michigan State’s Connor Cook in Week 2, and the learning curve could be plenty steep enough to keep Oregon from getting back to the final round. Brynn Anderson/AP For the second season in a row, Alabama’s starting QB remains a mystery entering Week 1. At this point, we’re conditioned to expect all new Bama quarterbacks to leap fully formed from Nick Saban’s head, confident and armed with the wisdom of the identically floppy-haired “game managers” who came before them. On Saban’s watch, the Crimson Tide have claimed two national championships behind first-year starting QBs (Greg McElroy in 2009, AJ McCarron in 2011), and they earned the top seed in the playoff last year behind a third, Blake Sims. The average Crimson Tide fan may be more likely to express concern over the secondary, the one unit that has most clearly underperformed the past two years relative to the championship heyday of 2011-12. But the quarterback? The quarterback will be fine. Except, um, who is the quarterback? The favorite to succeed Sims coming out of spring practice, redshirt freshman David Cornwell, struggled early in preseason camp and now isn’t even among the top three candidates to play in Saturday’s opener against Wisconsin. Of those three, the new odds-on favorite to take the first snap is redshirt junior Alec Morris, a former three-star recruit who was widely regarded as an afterthought in the competition until roughly two weeks ago. 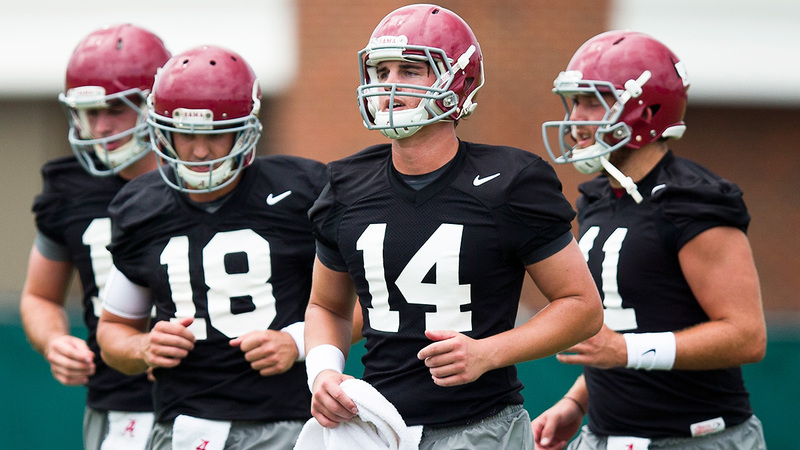 The other contenders are Jacob Coker, the Florida State transfer who unexpectedly lost out to Sims last year, and Cooper Bateman, who appeared to be so far out of the running in the spring that he split his time between quarterback and wide receiver. Saban, of course, insists he’s “confident“ in any or all of the above to handle the job, which is good enough for the faithful. But in an era in which even Alabama can’t be expected to hold opposing offenses below 20 points on a weekly basis, the benefit of the doubt doesn’t come quite as easily as it once did. 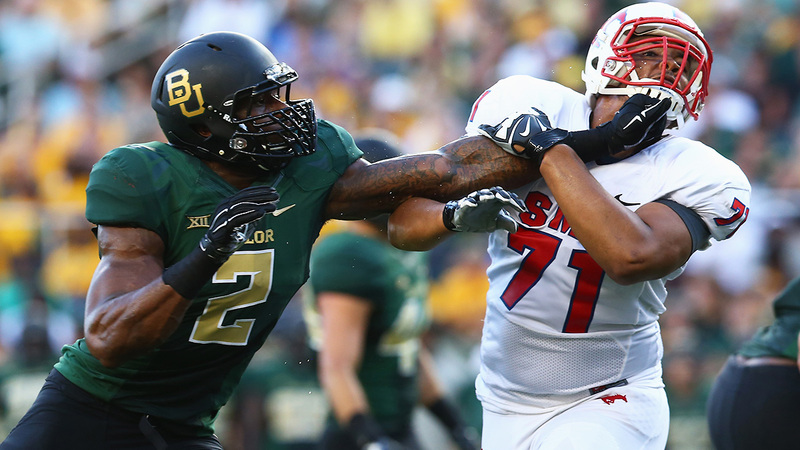 Ronald Martinez/Getty Images Shawn Oakman is a future pro; can the rest of Baylor’s defenders keep pace? There’s a red flag to raise about Baylor’s ground game, which was conspicuous by its absence in both of the Bears’ 2014 losses, to West Virginia (95 yards) and Michigan State (minus-20). But harping on that would be like obsessing over a small scratch on a car that’s missing a tire. The real, persistent issue for Art Briles’s program is a defense that, while dramatically improved from the highly flammable units that ranked among the nation’s worst a few years ago, still lags behind the curve compared to the kinds of defenses that tend to win championships: Against FBS opponents, the 2014 Bears allowed more points per game (27.2) on more yards (396.8) than any team that’s claimed a national title in the BCS/Playoff era, and fared far worse than any recent championship outfit in Defensive S&P+ (39th, compared to a low of 17th among national champs, turned in by the 2010 Auburn Tigers). It’s not impossible to win big with those kinds of numbers if you have the offense to cover, which Baylor certainly does, but it is difficult when the defense yields 40 points or more in four games and allows more 30-yard pass plays than any other FBS team. Baylor partisans will counter that the 2015 unit, anchored by a pair of returning All–Big 12 picks (and future NFL draft picks) on the defensive line in Shawn Oakman and Andrew Billings, is poised to take the next step. Frankly, I tend to agree, especially with four returning starters on the back end. Until the secondary proves it can be counted on not to get torched on a semi-regular basis, though, the margin for error remains very small for a team that may have to run the table to convince the selection committee to absolve another embarrassing nonconference slate. 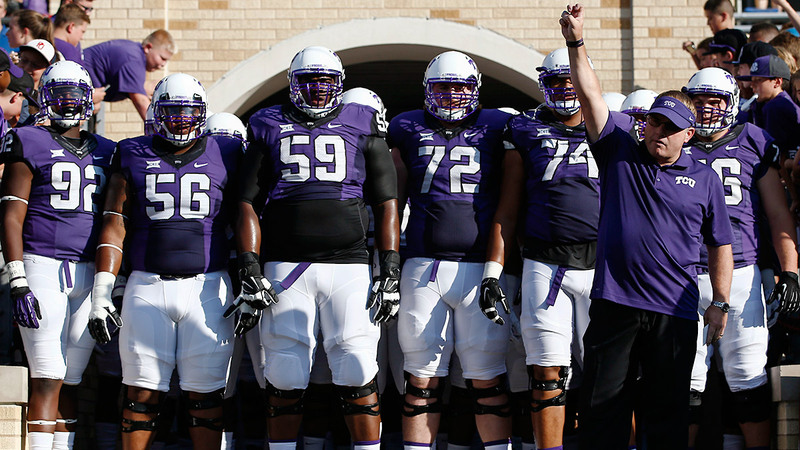 Jim Cowsert/AP Gary Patterson will have to rely on a number of inexperienced defensive starters in 2015. For all the attention heaped on the Frogs’ offensive resurrection in 2014, the defense more than held up its end of the bargain, finishing near the top of the Big 12 in yards and points allowed as well as Defensive S&P+; crucially, they also ranked second nationally with 40 takeaways, four of them coming in the 42-3 Peach Bowl romp over Ole Miss that elevated TCU onto the short list of serious preseason contenders. Man-for-man, though, the 2014 defensive lineup is only a memory: Although the line returns largely intact,2 the linebacker and secondary units were decimated by attrition, leaving the Frogs to replace six of last year’s top seven tacklers. That number includes all five defenders who landed on the All–Big 12 team, a quintet that effectively started together for three seasons3 and last year accounted for a slight majority of the defensive turnovers. As kickoff approaches, the vacant linebacker spots remain “a wide-open deal,” according to coach Gary Patterson, with at least one likely to be occupied by a not-especially-touted true freshman who has never played linebacker before. The strong safety positions (a hybrid safety/linebacker role in Patterson’s 4-2-5 scheme) are also in the hands of two brand-new starters, as is the second cornerback spot opposite incumbent Ranthony Texada, who can only hope his play one day matches the excellence of his name. In the nation’s most perennially pass-happy league, a formidable pass rush can only do so much. 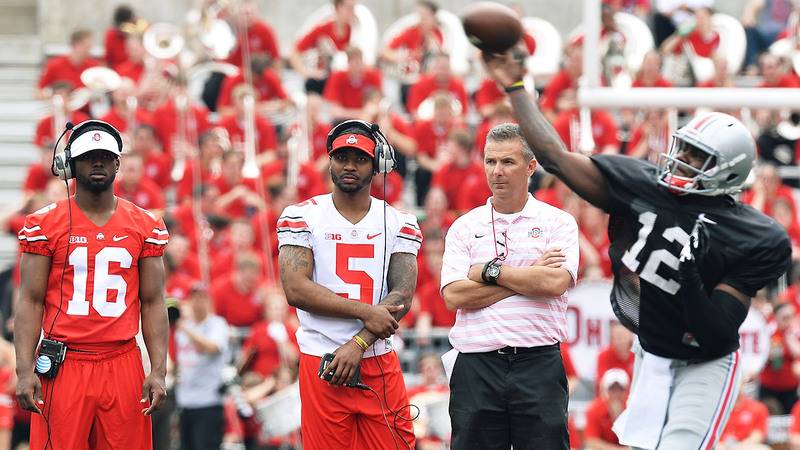 Jamie Sabau/Getty Images Ohio State has no shortage of star power. What the Bucks need is a clear identity. What can go wrong for the team that has everything? Not much, probably, as long as the Buckeyes resist the temptation to try to be everything. Even the most talented, finely tuned college outfits lack the time, skill, or mental bandwidth to master every corner of the playbook: They need an identity. During last year’s postseason run, for example, the offense was at its best as an old-school, power-running attack, with 225-pound tailback Ezekiel Elliott shouldering a heavy load between the tackles4 and everyone else playing a complementary role off the primary threat. Ohio State was the underdog in all three of its postseason wins, though, which lent itself to a very different mentality than what it will likely foster in 2015 as the overwhelming favorite to repeat as Big Ten and national champion. This year, with so many gleaming offensive weapons at their disposal, it’s not hard to imagine coaches focusing so intently on how to distribute the ball “fairly” — X number of touches per game for Braxton Miller, X for Michael Thomas, X for Jalin Marshall and Dontre Wilson, etc. — that their egalitarian efforts could at times come at the expense of establishing their bread and butter. Already there’s hand-wringing in Columbus about how the unresolved quarterback tango between Cardale Jones and Barrett (both of whom will apparently see the field in next Monday’s opener at Virginia Tech) might affect the fragile balance of team chemistry, and the fact three offensive starters will be suspended for the first game only exacerbates those concerns. Of course, boasting so many attractive options that you don’t quite know what to do with them all is the best possible problem to have; it’s the problem all teams aspire to, and one Urban Meyer has successfully navigated before, during his Tebow-fueled run at Florida. But as we saw with the team that occupied this no. 1 position in 2014, Florida State, having all the right pieces doesn’t guarantee they’re going to come together as seamlessly as they have in the past: In the end, the Seminoles were good enough to earn a playoff bid with another undefeated regular-season record, but they never once looked like the best version of themselves in the process, and ultimately went down in flames when finally confronted with a playoff-caliber opponent. Like FSU last year, Ohio State clearly deserves to be the overriding preseason favorite. How the Buckeyes handle that status, though, may turn out to be the most enduring and consequential question of the year. Note also that the “Ranked” column doesn’t include Kessler’s meh performance against the Pac-12’s best defense, Stanford, which was ranked at the time but finished 8-5 and just outside of the polls. The front four did lose all-conference DT Chucky Hunter, but returning vets James McFarland, Terrell Lathan, Mike Tuaua, Josh Carraway, and Davion Pierson have combined for 65 career starts. Hunter, cornerback Kevin White, and safeties Chris Hackett and Sam Carter all cracked the starting lineup in 2012 and held down those jobs throughout 2013 and 2014; the only exception was linebacker Paul Dawson, a junior-college transfer who didn’t enter the starting lineup until midway through the 2013 campaign but graduated as arguably the most accomplished of the five — ultimately, he was the only one drafted. Elliott carried the ball on 34.9 percent of OSU’s offensive snaps in the wins over Wisconsin, Alabama, and Oregon, personally accounting for more than 42 percent of the team’s total offense and eight of its 18 offensive touchdowns.